The Geodesic Dome is an an engineered structure which encloses space more efficiently than any other structure. The maximum amount of space is enclosed with a minimum amount of surface area and materials. This is a geometric fact. When constructing a geodesic dome, we are not buying and installing expensive materials for the purpose of supporting other expensive materials. A dome is completely self-supporting. 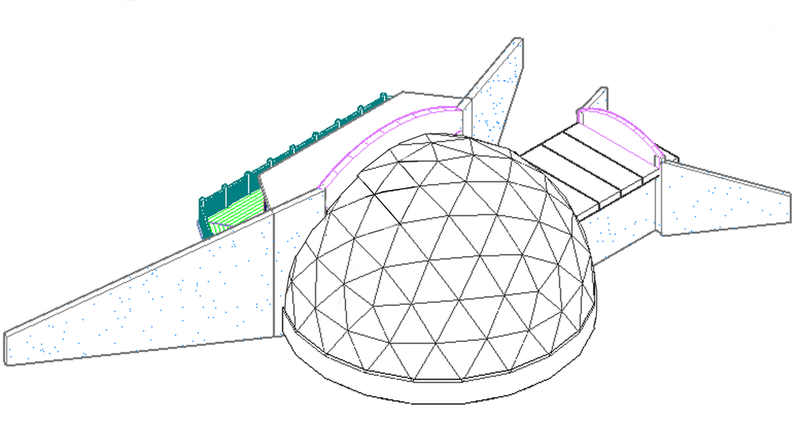 The geodesic dome has 38% less surface area than a rectilinear structure of the same square footage, and about the same amount in material savings as well. to them into the future and for as long as they stand. The obsolete paradigm became obsolete for its failure to recognize and implement advances in technology that would allow for greater advantage over the conditions that we face. And this was true BEFORE the advent of the predicted ‘extreme weather’. The consequences are that we are now at an extreme disadvantage to the forces we face for successful living. The equation of the paradigm over time is that the advantages lessen and the disadvantages increase, eventually forcing something characteristically new and different to emerge. This is called a "paradigm shift". With the uncertainty of utility costs, the possibility of no available energy scenarios and the likely continued occurrence of weather extremes every year, is the implementation of the new construction paradigm not long overdue?